Got any extra lights, balls, Santa hats, garland, Spode dishes or any other Christmas detritus lying around? Well, hell, get out that glue gun and start "enhancing" a sweater that was ugly to begin with! I thought the whole point of an UCS competition was to scour Goodwill stores and estate sales to find the castoffs of little old ladies? These guys make it way too simple (and expensive - seriously, $65 when your cost is $12?!). ‘Tis the season not just for shopping and overeating but for committing to a health insurance policy. The Obama administration just announced a one-day extension of the registration deadline, tacitly advising Americans to spend Christmas Eve selecting a policy that's the least of deductible and provider-choice evils. Ho ho ho. I’ve spent hours this month on Covered California as well as numerous insurance company sites. I was trying to find a policy that includes Cedars-Sinai Hospital as a provider. Not so easy. Apparently Cedars, the best hospital in town, is also the most expensive, and no insurer wants to subsidize the highest quality. Only the second-rate, the mediocre, merit funding. When Clinton announced “Don’t Ask, Don’t Tell” as a military policy, it was groundbreaking. Imperfect, but a step forward, a step leading to the current gay-friendly policy. The Affordable Care Act, too, is a step forward. Unfortunately, that fact is being obscured by a poorly handled roll-out and the fact that insurance companies still hold almost all the power. But without this agonizing, infuriating, hellish step, 20 years from now there will still be families losing their homes over hospital bills. The first step is the hardest, but don't take it and you'll never reach the finish line. 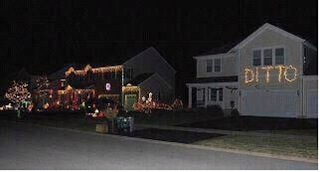 I love this lazy approach to Christmas decorations. Black Friday started early this year, with idiots shoving, threatening, even assaulting to get what they want. They skipped time with family (maybe not such a sacrifice), dinner, even football, to line up in bitter cold for cheap flatscreens, Michael Kors purses and toys that will be discarded by New Year's Day. Seriously guys, it's not worth it! From the unfriendly mom at the sink to the immobile grandparents abandoned at the cleared table, to the beastly kids, this one just screams Hellish. What's more disturbing: the fighting or the number of stairs this couple has to climb to get to their apartment? Brings new meaning to the expression “Just shoot me.” From Columbia, Missouri. Tip of the Day: Don’t tell the cook that his homemade holiday dressing tastes like puke when he is making the Thanksgiving grocery list. Given a choice between football and listening to family members fiddling, which would you choose? This year I'm spending my Thanksgiving alone. I had plans to join a friend's family and was assigned dessert. So I baked three pies (see below) and got a manicure. But various medical situations put the bulk of her family out of commission, so here I am, halfway through the apple-cranberry. Sure, there were other places I could have gone. I'm not a pariah. But after the events of recent weeks (all around swirled death, medical emergencies, breakups, job loss and substance abuse relapse), I chose being alone and reading. 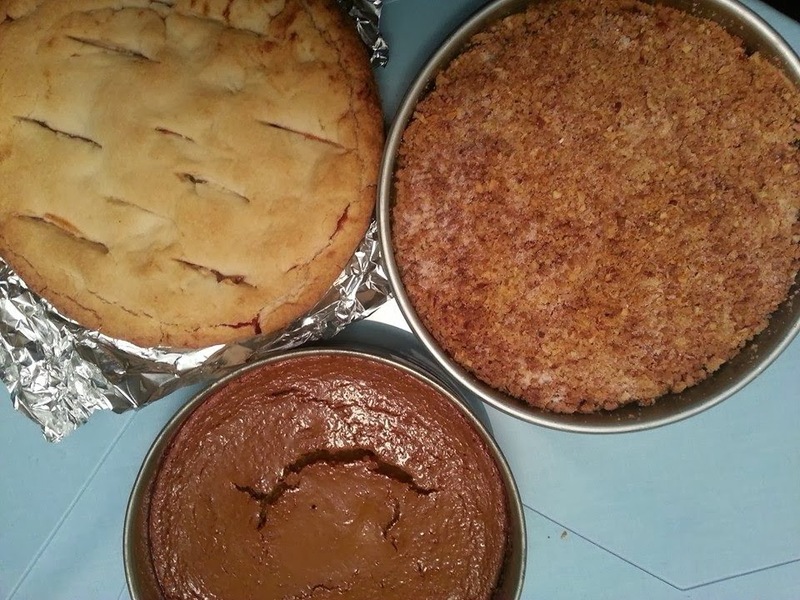 I sent my son off to his father and settled in for pie and Fear of Flying. When I was babysitting in the mid-'70s, Fear of Flying by Erica Jong was on every mother's bedside table. A zipper opening to reveal a naked woman's torso, a salacious blurb by John Updike -- the cover was definitely compelling, but the fact that middle-aged women were reading it meant it wasn't for me. Now that I'm middle-aged myself (OK, 20 years older than those young mothers, but never mind), I decided to give it a shot when I found it at a yard sale. And oh my. Even today, 40 years after its initial publication, it is shocking. Filthy. As Updike promised, "uninhibited." Also a perfect of-the-moment snapshot of the early '70s implementation of the late '60s decree to let it all hang out. Women's lib, sexual freedom, the foundation of the '80s "Me Generation" - it's all here. So I'm making my way through a bevy of Thanksgiving baked goods and the sexual adventures of a fictional feminist favorite. In the back of my mind I'm worrying about the problems affecting those near and dear to me and trying to feel grateful things aren't worse than they are. In the front of my mind, though, I'm in Vienna and Heidelberg and the Upper West Side with the shrinks and the lustful Isadora. This family needs to learn the joys of passing. Existential angst has no place at the Thanksgiving table. Cats aren't know as the most grateful of animals, and the people who own them tend to overstate their cuteness. A recipe for hellishness. Screw the Gravy, Bring on the Conditioner! Heh! Where will you be spending Thanksgiving night? Warm in your bed, in a Tryptophan-induced coma, or camped out in a sleeping bag by a superstore in a line defined by crime scene tape with hundreds of your rivals for limited quantities of this year's model of Tickle-Me Elmo? What I'm really asking is: are you a Black Friday believer? Personally, I'm not. I can appreciate clever marketing gimmicks and catchy catch phrases, and greatly admire whoever dreamed up the concept of prodding suckers out before dawn to spend more than they imagined under the guise of saving a bundle. After all, if Black Friday is the busiest shopping day of the year, extending its hours can only be considered making a good thing better, at least to those who swipe the credit cards. But as much as I enjoy knowing the buzzwords, I consider myself immune to all that retail posturing. Why risk a trampling for a bargain you can't even get if you haven't already staked out your spot? Unless you're a "people person"--and these days you'd have to be crazy to call yourself that--you're better off at home. This year, Amazon.com is offering hourly deals along with thousands of products on sale for a limited time. Count me in. Google searches for the term "Black Friday" are up exponentially. This hellish kickoff to Christmas shopping is generating interest earlier and more widely than in the past two holiday seasons. Searches on the term "black Friday ads" are up exponentially every year since 2005. The brick-and-mortar stores want you to catch the fever, and they try to do it by controlling information. They withhold their specials until the morning edition of that old-fashioned hunk of dead trees known as a newspaper hits your front porch on the fourth Thursday morning of November. They want you to plan your spending while you're in a raw-turkey-induced hysteria of getting ready for a dozen relatives you don't really like, or a drunken stupor after the carcass has been stripped bare. Websites that have sprung up to offer sneak peeks at their deals have received cease-and-desist letters and have been forced to remove pricing information, known in legalese as "trade secrets." Although she says it feels like in happened in a previous life, and almost doesn’t seem real at this point artist Barbara Stanton still remembers every detail of a series of hellish Thanksgivings tied to her now ex-husband and his family. The first two set the tone but the third is when the turkeys come home to roost. It was one of our very first Thanksgivings as a married couple and we had a three-month old child. We went to my grandparents' house, which was a lovely gathering with wonderful food. My husband picked fights with my grandpa and uncle and I couldn't figure out what his deal was. We did eat dinner but left early, my husband in a huff. On the way home we had a big fight because he said everyone was phony and only pretending to be nice. He accused my grandfather of not loving me as much as he loved me. He claimed my uncle was drunk. He said he would not go to any more of my family's events in his lifetime, and he stuck to that pledge. When I went, I had to go alone with my kids. The next year we went to his relatives' for Thanksgiving. It started out fine but about halfway through everyone was screaming and yelling. He had four brothers and three step-dads (although only one was there!) so there was a lot of drama. I realized why he had been so uncomfortable at my normal family gathering: it was a completely unfamiliar concept. Several years later, when I had two young children, ages three and six, I got his mother to allow me to host Thanksgiving dinner for the first time. Although I’d never cooked a turkey myself, I thought I was capable and was excited to do it. And I did have a mom I could consult. But his mother insisted on bringing the turkey, so I decided to make a ham. Three of his brothers were coming with their little kids, plus his mom and current step-dad. Thanksgiving morning everyone showed up around the same time. The mother walked in with the turkey but announced she wouldn't be staying because then she wouldn’t see her other grandchildren on Thanksgiving. So she was going to the brother’s house. They dropped the food, kidnapped my kids and went out the door. My husband had a raging fit. Luckily he didn’t blame me. He left in yet another huff, and I don’t know where he went. So within 20 minutes of their arrival, everyone had left and I was all alone with a full Thanksgiving dinner. The next day I invited some friends over and we had a big dinner with the leftovers. I told my husband I would never have his family over to my house again. No one ever apologized to me. Check back later for hellish Christmas stories! Sort of makes you appreciate your own family. Sort of. Isn't he outgrowing this act yet? This infamous episode of WKRP in Cincinnati answers that question. "It gets pretty strange after that." 1. Multiple Generations. Two generations can be grating, but it's hard to be hellish without a grandparent in the mix. In a pinch, aunts and uncles can raise issues thought to have been put to rest for decades. 2. Lowered Expectations. "Can't we all at least pretend to like each other this year?" In other words: let's not actually like each other, just fake it for a few hours. Sadly, even this dream can die hard. 3. Kitchen Disasters. The turkey caught fire, the oven died, the dishwasher broke — holidays with ruined food and hand-washing of service for 18 are classically hellish. 4. A Well-Placed Insult — and Its Riposte. "I always knew you felt that way! Now I can tell you how I really feel about your [significant other, relationship with Mom, personal cleanliness, Jello mold...]." 5. Inappropriate Escorts. Bring a date with full-body tattoos and an ankle monitor to Grandma's house and you're just asking for a memorable meal--and not in a good way. Ditto someone too old or young, too poor (no such thing as too rich) or too felonious. 6. Special Diets. "What do you mean, is the turkey organic? Of course not. You don't get a breast like that without hormones!" Watching someone load up on one food and bypass all the others gives the whole rest of the table something to mutter about. 7. Sports. Hours and hours of NFL as a soundtrack can fray nerves and build resentment as we flash back to the '50s when women slaved away in the kitchen while the menfolk sat around. The only thing worse would be hockey. 8. A No-Show. Your sister blew off the dinner? Dad ran to the store and never came back? While it's fun to build unanimity among those left behind by trashing the departed, missing relatives cast a shadow over the proceedings. 9. Physical Injuries. Someone slipped on cranberry sauce and had to go to the ER. Grandpa didn't make it up the stairs - so much for that new hip. Let's face it: when paramedics show up, the holiday goes straight to hell. 10. Special Announcements. "I'm going to be a mother--and there is no father." "I'm quitting my job to stalk Courtney Love." "You know, Rush Limbaugh has it all figured out." These kinds of comments don't just ruin dinner, they shatter lives. Latkes Instead of Stuffing - One Year Only! For the first time since 1899, Thanksgiving and Hanukkah will coincide. 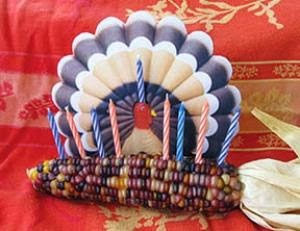 Enjoy, because the convergence of the first day of Hanukkah and Thanksgiving will not happen again for...wait for it...70,000 years. For an explanation of why, click here, because this is so complicated I just can't wrap my shiksa head around it. Photo from the Wisconsin Jewish Journal. Powerball Fever recently gripped the states offering it, and California is the most recent addition to those ranks. Last week I was stunned when my friends - people who live comfortable lives and otherwise don't seem prone to throwing their money out the window - bought Powerball tickets. And talked rapturously about what they would do with their winnings, about $300 million cash. After those two gimmes come the inevitable fantasies. Multiple homes. International travel not involving cheap hotel chains. Servants. Cars. Designer clothes bought at retail. Books bought at the last remaining independent booksellers. I'm pretty sure the comfortably well-off didn't used to buy lottery tickets or have these fantasies. Hell, even the middle class was able to achieve most or all of those things. But in these days of lowered expectations and a corporate culture that has conspired to wring every dime out of must-haves that used to be affordable (housing, healthcare, insurance, education, food, gas...), no one in the 98 percent feels rich or confident about the future anymore. Treading water is the new striving. Not worrying is the new luxury. As we roll into summer without the promise of $300 million for our bank accounts, Powerball disappointment will fade and life will go on. We're all pretty lucky we have enough to survive on and of course each other. But I won't be able to stop thinking about the fact that a $300 million payout briefly became a viable exit plan. Surely there has to be a better way to get off the fiscal cliff.